If you want to link to the wonderful world of Kitesurfing, Cogua KiteCenter has complete and diverse packages designed for all ages, genres and budgets ranging from the most basic and economic, to complete special packages to satisfy each and every need while you are learning about this wonderful sport in Lake Calima - Colombia that has a 90% wind availability all year round. We have excellent plans and services that include the lessons, transportation, hostal, sale of new or used equipment, design and manufacture of kiteboard, equipment or accessories rental. Specialized advice of Cogua Custom, that being manufacturers gives you the security and the backing of having a company dedicated solely and exclusively to satisfy all your needs when it comes to practicing Kitesurf. 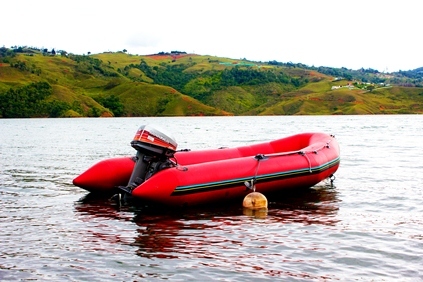 For your peace of mind and safety we have the latest equipment that has all the safety equipment together with a rescue boat that will always be close to you and your instructor to give you the greatest backing in the water. 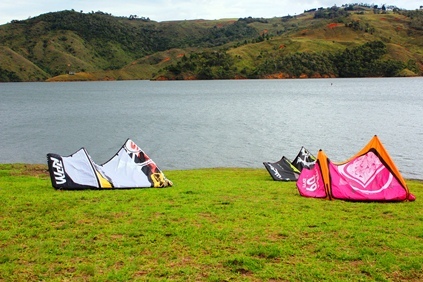 If you stay in other place than Calima Lake, Cogua Custom has made an alliance with many schools in different cities in Colombia and countries like Ecuador, Panama, Cayman Islands, Venezuela, Peru and the United States that will give you the benefit of obtaining great prices and a correct advice on the learning of the sport. • Personalized Kitesurf Course: Accompaniment from beginning to end with instructor, support boat and all necessary equipment, which are of last generation for safety and fast learning - $ 140,000 Pesos / Hour. • Supervision Kitesurf: Correction and reinforcement of Upwind technique, rescue in boat (if you need it) and constant communication with instructor (does not include table, kite and harness). - $ 80,000 Pesos / Hour. • Kites sales and Accessories: At the end of the course you can buy with us, new or used, complete or individual equipment (Comet - harness - Table - Suits), in different prices depending on your needs. If you are not sure which product to buy, we can give you a very detailed advice on the different brands and its functionalities at no cost. • Hostal Service: Includes hot water, kitchen, bar-terrace for roasts and a beautiful view of the lake. It is located within Darien close to bakeries, supermarket, fruit shops, drugstores and nightclubs. It is 10 minutes by bus from the school (Transportation Darien - Lake every 45min value $ 1,600 pesos per way). - Shared room $ 30.000 Pesos 1 day x 1 person. If you are traveling from Cali you should only arrive at the main bus station and go to the office of transcalima (second floor) and buy ticket Cali-Darien that has a price of 15,000 pesos.